Two more seats for the 2013 F1 season have been locked in with word from Toro Rosso overnight confirming they will retain their current driver line up of Daniel Ricciardo and Jean-Eric Vergne. The 23-year-old Australian, who has scored nine points so far this year, is looking forward to building on a solid, if unspectacular, year. “There are big expectations for next year and I’m ready and willing to fulfil them. I feel I have been growing and developing as a driver and my approach to the technical side of the sport has also progressed this year, so I am sure that will serve me well in my second season with Toro Rosso,” Ricciardo said. The 22-year-old Frenchman, generally out qualified by his teammate, but having scored 12 points sounds almost relieved at the news. “I am really happy about this great news. Thank you Toro Rosso and thank you Red Bull, who have backed me since the early days of my career. It has been a difficult season and, as a rookie, I have learned a lot, thanks to the support I got and the excellent relationship I have enjoyed with all the guys. I feel much stronger now and I know I have become a better driver over the course of the season,” Vergne said. 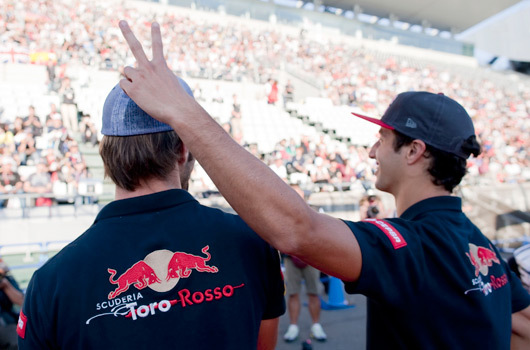 Scuderia Toro Rosso is pleased to confirm that it will continue with its current driver line-up of Daniel Ricciardo and Jean-Eric Vergne for the 2013 Formula 1 season. It will be the second year with the team for both of them. Good news for Dan, it seems like a simple decision to keep him for next year. Despite his extra points, Vergne hasn’t been performing as well – he’s lucky to keep his seat methinks.